You know those moments in a favorite song that you just want to play over and over and over again? And it NEVER gets old? I have favorite songs that never get old, but this is really more specific. This particular moment has become a joke between my brother and me, and between other friends. Every time I hear it, it makes me happy. 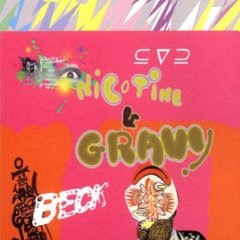 Beck's Midnight Vultures from, 1999, (it's over 10 years old, WOW) has a fabulously silly, funky, energetic vibe all the way through it. It was my favorite CD to cook dinner to while I was living in a co-op in undergrad and now it's great for driving. check it out, click to 3 minutes in. Is he actually saying anything? I know, it's ridiculous. I LOVE IT!